For the last 10 years the Hotel Pelirocco has been a Brighton byword for opulent debauchery, a true rock’n’roll stopover on regency square. We spoke to the owner Mick Habeshaw-Robinson. How would you define the concept of boutique accommodation? Individuality really, making your own mark and not being part of the mainstream Travelodge Holiday Inn set-up, offering something a bit more personal for people. Tell us a bit about the rooms. 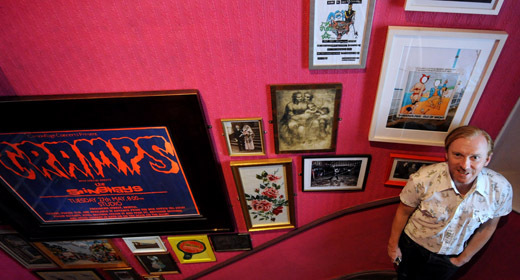 We’ve got 19 themed rooms, based around music, fashion and art – maverick characters from pop culture over the last 40 odd years, people like Diana Dors, Bettie Page, Leigh Bowery, Jamie Reid, and the mod links that come with Brighton. You do more than just accommodation though? Yes, there’s our Singstar Lounge, it’s a private room that holds about 10 people. We do t-shirts and we did put a compilation album out, but by the time we got round to doing volume two people had kind of stopped buying CDs. It had Scissor Sisters’ ‘Comfortably Numb’ on it before the single came out, Dean Marsh who put it together with us knew it from the clubs – it got a lot of recognition from being on our CD, the band have been back since and acknowledged that, which was nice. Do you think the Pelirocco has been influential? Indirectly I think; we made hotels more individual. It’s hard to believe now but 10 years ago it was all just chintzy B&Bs. I think we turned a few heads, yeah. Who’s the most exciting person you’ve had to stay? I’d say Mani from Primal Scream – everybody loves him to bits, he’s really friendly and down to earth. We had the Beastie Boys in; being Americans we made sure the eggs were over easy for them, ha ha. Has the rock’n’roll behaviour even got out of hand?